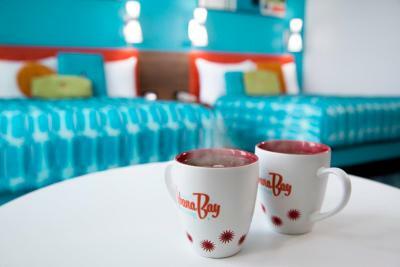 Lock in a great price for Universal's Cabana Bay Beach Resort – rated 8.9 by recent guests! Really nice Hotel overall. 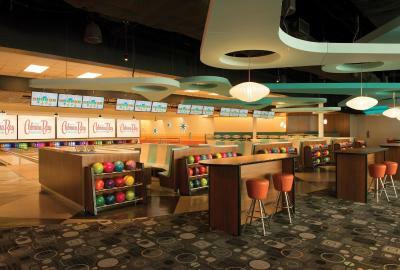 Nice pools, Bowling was great but expensive. 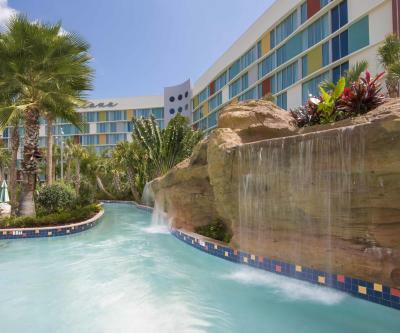 We loved the location of the property which was just two steps away from Volcano Bay. 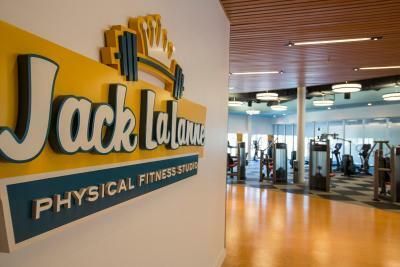 The staff was nice, helpful and friendly. The hotel was super clean and had lots of kids activities. 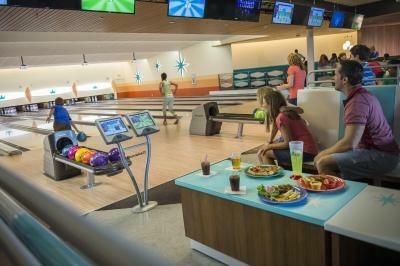 We enjoyed the bowling night, making s’mores by the fire pits as well as playing other games. Room was ready at 12 which was nice. Food was good, but expensive. Beds were comfy. The employees seemed to work hard. Fantastic fun hotel for the whole family. 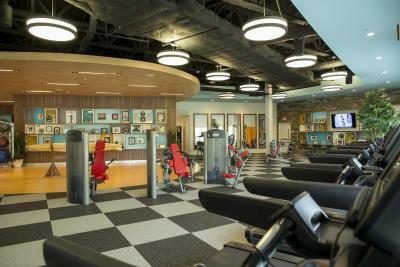 Great amenities, location and staff! Everything was great at this hotel, the poor an the cleanliness was amazing and I am very fussy. 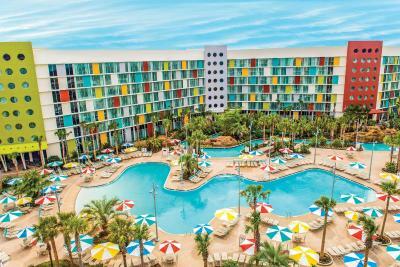 Universal's Cabana Bay Beach Resort This rating is a reflection of how the property compares to the industry standard when it comes to price, facilities and services available. It's based on a self-evaluation by the property. Use this rating to help choose your stay! 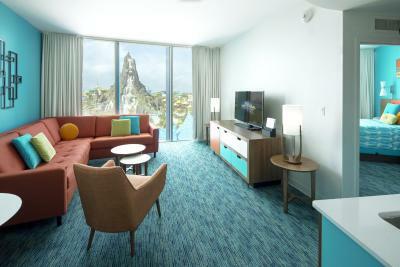 All rooms at Universal’s Cabana Bay Resort feature a 40-inch flat-screen cable TV. Coffee-making facilities are also provided. Guests can stay in traditional or poolside rooms as well as spacious family suites which include fully equipped kitchenettes. 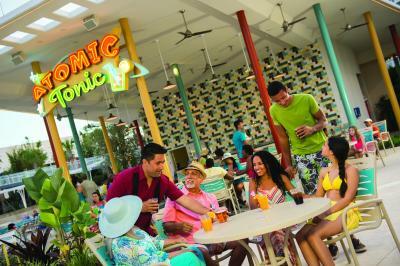 Free WiFi and a free transfer to all 3 Universal Orlando theme parks and Universal CityWalk™ are provided. 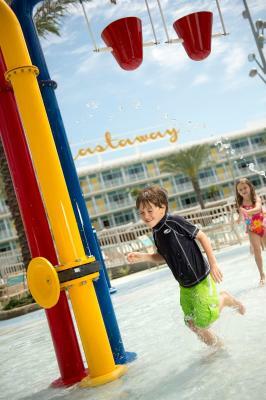 Guests can relax at 2 zero-entry pools, in a lazy river, or on the beach. 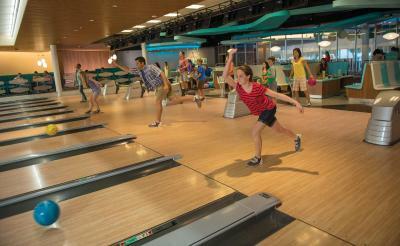 A water slide, 10-lane bowling alley, and fitness center as well as a game room are on site. 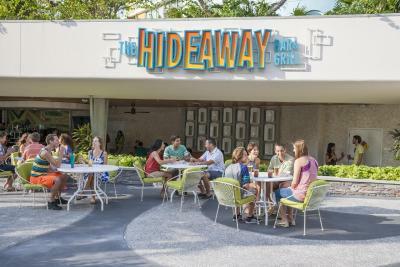 Universal’s Cabana Bay Beach Resort can make dining in or take out easy for guests. 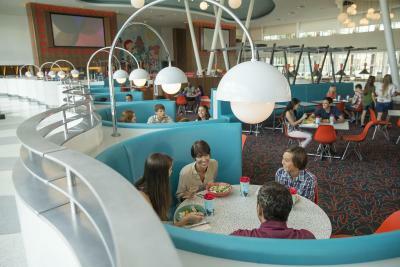 The food court offers burgers, milk shakes, pizza, and sandwiches. 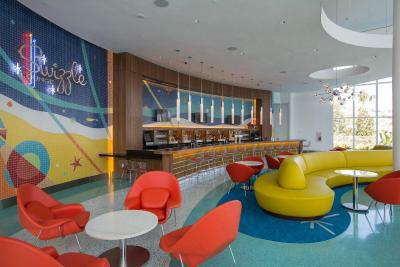 A coffee shop is on-site in addition to lobby and pool bars. 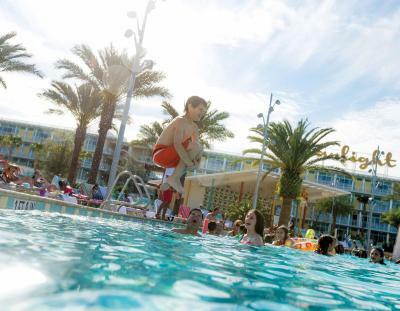 This resort is just 1 mi from Universal Studios. 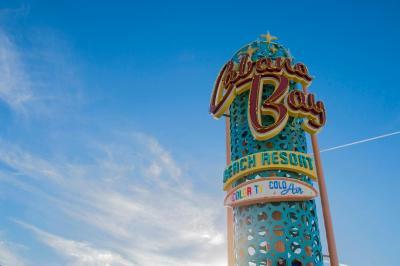 뀐 Located in the top-rated area in Orlando, this property has an excellent location score of 9.4! 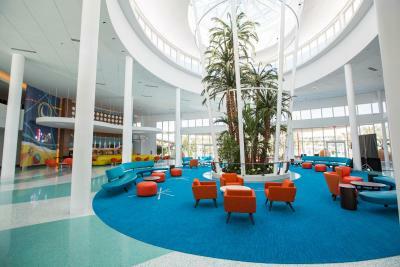 When would you like to stay at Universal's Cabana Bay Beach Resort? 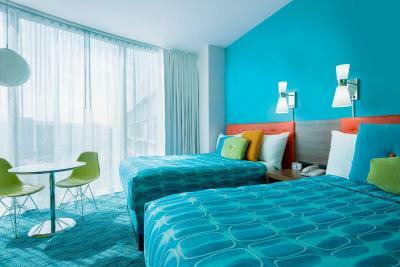 This room features a 40-inch flat-screen TV with high-definition channels. An iPod docking station and coffee-making facilities are also provided. 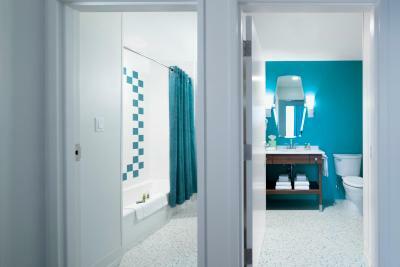 This spacious suite features a 40-inch flat-screen TV with high definition channels. 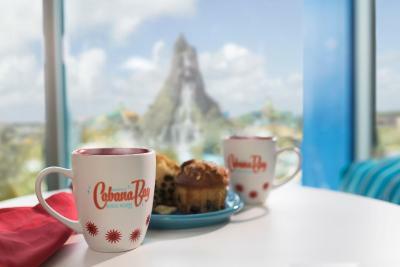 An iPod docking station is provided along with a microwave, refrigerator, and coffee-making facilities. 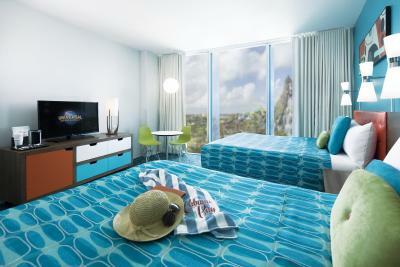 This spacious suite features 2 40-inch flat-screen TVs with high-definition channels. 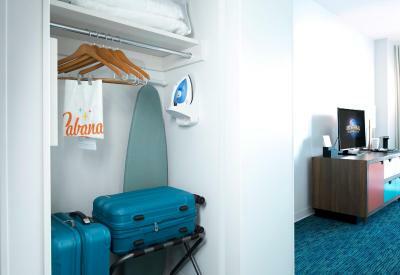 An iPod docking station is provided along with a microwave, refrigerator, and coffee-making facilities. This spacious 772 square-foot 2-bedroom suite offers 2 full bathrooms, a living room with a double-size sofa bed, and kitchenette. 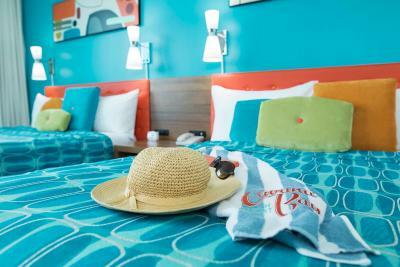 House Rules Universal's Cabana Bay Beach Resort takes special requests – add in the next step! 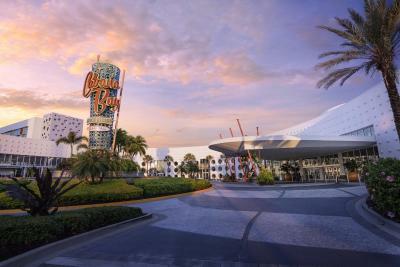 Universal&#39;s Cabana Bay Beach Resort accepts these cards and reserves the right to temporarily hold an amount prior to arrival. 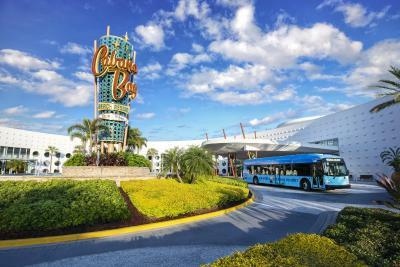 Universal's Cabana Bay Beach Resort accepts these cards and reserves the right to temporarily hold an amount prior to arrival. - Hotel check-in clerk was excellent. Other staff (check-in parking, staff at on-site restaurants) came across as disinterested in guest satisfaction and unhappy to be there. 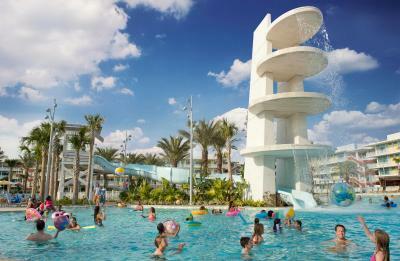 - Having to buy new flotation tubes for the lazy river is ludicrous. All the guests wanted to get rid of them as soon as they were finished using them. Waste of money, waste of plastic/vinyl resources, waste of time waiting for each one to get blown up, waste of time trying to dispose of them. - Limited recycling (unless it is sorted off-site) - Markup on food items that could be purchased at a nearby grocery store is to be expected for the convenience, but many items were double the price. Nothing is nice. Old hotel. No good restaurants. 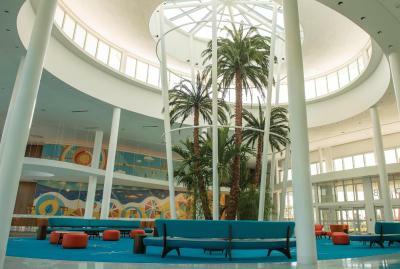 Old facilities. Dirty pool. Just not worth it. Dont book!!! Not much. Lazy river you have to purchase your own tubes. 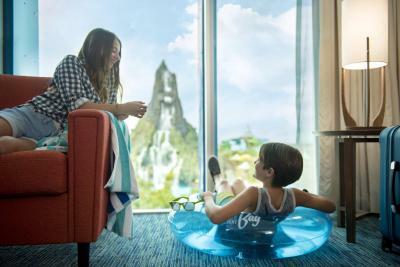 Would have liked to see waiters available to take orders when enjoying the pool side. There was not anything that we did not like! Everything was great! Need to Improve the transportation system. At night two hour line to return to the hotel. Need more vans or an alternative system in high season. 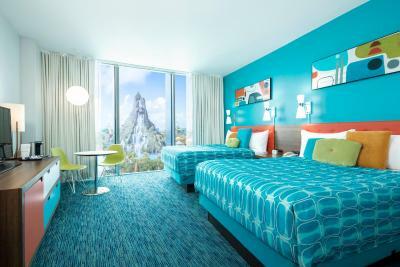 Did not happen at Disney Hotels. Bed was a little uncomfortable, but that’s just me being picky. Everything was great! The prices for food were really expensive, gratuitously so and the diner was a bit like a school canteen, there should be better and ore reasonable food options and more variety with the food. To put this into context a coffee was $4.80 and a croissant $3.50. I know prices are inflated because it is Universal but I found this a but excessive given you are paying extra for the hotel.